Days of Our Lives Recap: Hero Ben Saves Ciara’s Life! 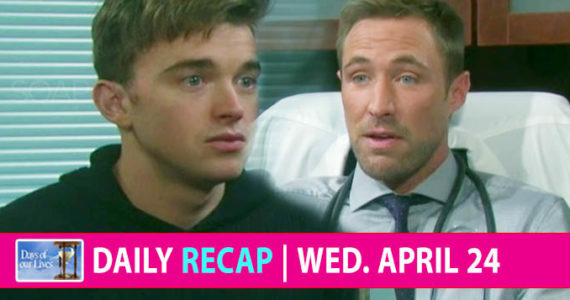 The Days of Our Lives recap for Thursday, February 14 features Ben playing the hero as he rescues Ciara from the burning cabin. Of course, Hope won’t believe that happened because… Hope. Jordan (Chrishell Hartley) took Charlotte and left Ciara (Victoria Konefal) for dead. She then went to the Horton house where Abby (Kate Mansi) caught her holding the baby. An armed Ben (Robert Scott Wilson) took Hope (Kristian Alfonso) away. Ted (Gilles Marini) found Eli (Lamon Archey) knocked out and went after Hope. He found her with Ben, who insisted to Hope that Jordan framed him and she has Ciara and Charlotte. Ted jumped Ben and he got away. Hope learned there was a fire near the cabin so she and Ted sped there. Meanwhile, Chad (Billy Flynn) found Ben, who updated him about Jordan. Chad knew where he’d go to frame him and they took off. They found Ciara, and she told them Jordan took Charlotte so Chad left as Ben saved her. Once out of the cabin, they shared a tender moment, but then Hope showed up with her gun. Of course. Jordan tried give the baby back to Abby but she learned about Ben’s escape and refused to hand her over. When Abby approached her, she pulled out a syringe. Chad arrived and said that Ben can’t hurt anyone because he killed him. He showed her the gun, and Jordan was distraught. Chad carefully took the baby from her and put her back in Abby’s arms. Rafe (Galen Gering) found Kate (Lauren Koslow) near death and called for help. Kayla (Mary Beth Evans) couldn’t understand why she didn’t wake up. Will (Chandler Massey) and Sonny (Freddie Smith) basked in the opportunity to spend Valentine’s Day together. They checked into a hotel under the name Justin Bieber and finally made love. John (Drake Hogestyn) tried to tell Marlena (Deidre Hall) that he’s Leo’s father but couldn’t do it. Instead, they ate strawberries and cream, exchanged coffee mug gifts, and talked about their love.